A photo collage is a nice way to combine your favorite memories in a single picture. A classic way to make collage is to to pin number of pictures in a board in different alignments. After digital photographs came in the market, a number of software programs have been developed to make photo collage using random algorithms or via manual inputs. CollageIt from PearlMountain Technology such a photo collage maker software, that makes the process of photo collage making, easier with lots of customizations. CollageIt comes both as a Free and a Pro version. 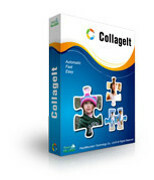 Free version of CollageIt Pro can be downloaded using This Link. Its a 7.7 Mb installer digitally signed by PearlMountain Technology Co., Ltd. Installation of CollageIt Pro requires administrative right. Installation is clean and smooth. It consumes 22 Mb of disk space. You will be asked to create Desktop and Quick Launch icons during installation. You will also be asked to launch the application and open welcome page at installation end. CollageIt Pro is compatible with Microsoft Windows 2000, XP, 2003, VISTA or Windows7/8 and can run on average hardware. After launching the software for the first time, it will ask you to choose the Template. You can upgrade to the CollageIt Pro version after entering license code in CollageIt Free. 2. Add color gradient. Gradient can be adjusted from Left to Right or the opposite. 3. You can select background from presets and set its alignments: Tile, Center, stretch, Stretch & Crop. 4. You can also adjust opacity. 5. Custom background is not allowed. 1. Set size of the panel from a set of presets or set it manually. 2. Set the orientable: Landscape & Portrait. 1. Add photos in the Photo List by browsing or via drag & drop. 2. Add photos from the Photo List to the Collage Panel either via drag & drop or by clicking buttons Random Layout, Shuffle etc. 3. You can set it to use some or all the images. 4. You can manage the spacing between each image. 5. You can adjust the margin. 6. You can select the photos as it is or choose those to Auto Rotate. You can even set the degree of rotation. 7. You can add frames to each image and can manage how bold it will be. 8. You can also add shadows in the images. 9. You can set those images to remain sparse. You will be able to manage the degree of sparse. 10. The random layout button will change the orientations and alignments in random. 11. You can also use Shuffle button, to just switch the images keeping same orientations. 12. Manually, you will be able to switch images from on cell to another. 13. You can add/delete image(s) from the list. 14. You can even crop an image in the panel. 15. you can preview the collage panel in full screen. 16. You can save the created collage as an image of desired format and quality. Currently CollageIt Pro supports 7 output formats: JPG, PNG, BMP, GIF TIFF, PDF and PSD. 17. You can create an email the collage using your default client. 18. You can directly upload created collage to Flickr or Facebook after authorizing the application, adding tags, title, description, privacy and album details. 19. You can also directly set the created collage as your desktop background with desired orientation. 1. You can change skins. Four color schemes are available. 2. You can save the layout of a current collage as .tpl file and keep it later use in another collage. 3. You can upgrade directly from the free version but will need to restart the application for the change to take place. 4. Online help is available. Free version of CollageIt has some limitations. Photo cropping is not available, large size collage export is not possible, free support is not gettable. CollageIt Pro is available in both Personal and commercial versions. You can get 30% discount on all the licenses. Personal License: Use Coupon Code PM30CP ; Use this link. Commercial License: Use Coupon Code PM30CP ; Use this link. This entry was posted in Free, Graphics Management, Software, Windows and tagged Photo Collage Maker.